Ladies Printed Embellished Polyester Missy Size Tunic Top Blouse S-M-L-XL NWT. ❤US STOCK ❤FAST DELIVERY ❤60 days returns accepted! Women's blouses can be either dressy or casual. They come in a rainbow of hues and a variety of different prints. They can be embellished with embroidery, sequins, ruffles, beads, buttons, or fringe. What styles of women's shirts are available? Tailored button-down shirt: This is a classic shirt silhouette that's timeless in design. It can feature a high, tailored collar or a rounded Peter-Pan type of collar. Peplum top: The distinguishing features on a peplum top are the slim-cut waist and the expansive draped swath of fabric that falls gracefully over the hips. This type of top tends to be feminine. It can range in style from classic to trendy. Peasant blouse: These can be cut in a variety of silhouettes. One common design is a gypsy-styled tunic top that resembles a traditional Mexican huipil. This type of top is frequently embroidered with colorful wool or cotton thread. Another common type of gypsy top laces up in the front. Floral printed peasant blouses are also typical. Wraparound blouse: Wraparound tops wrap around the body. They feature some sort of closure, typically buttons or ties. They can be casual, tailored, businesslike, or fancy. Off-the-shoulder blouse: The distinguishing characteristic of an off-the-shoulder top is that the shoulders are always left bare when you put one on. 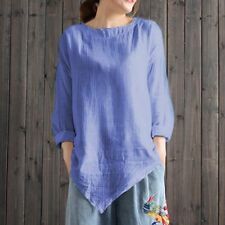 This type of top can have long sleeves, short sleeves, flutter sleeves, bell sleeves, or a number of other sleeve types. What kinds of blouse fabrics are common? Shirts are made in just about every imaginable fiber and weave type. Silk and chiffon blouses are much beloved for their luxurious drape. Cute blouses also come in cotton, ramie, polyester, rayon, linen, wool, acrylic, and other types of material. What styles and fabrics are work blouses made in? Fancy or tailored button-down silk work blouses are appropriate to wear as office attire. Many crepe blouses are suitable for wearing to work under tailored suits. Oxford cotton shirts are a more conservative alternative. They are also suitably businesslike for career wear. What are some common designers and brands that manufacture tops? Ann Taylor is a well-known label making conservative and tasteful work blouses available. Ralph Lauren makes a mix of different silhouettes available including tailored, dressed up and casual looks. Laura Ashley makes ruffled and romantic designs available. Anthropologie makes cute blouses in a variety of silhouettes.